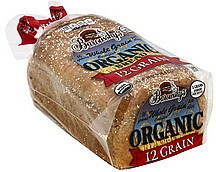 Organic Whole Wheat Flour, Water, Organic Wheat Flour, Organic Rye Flakes, Organic Steel Cut Oats, Organic Hard Red Wheat, Organic Barley Flakes, Organic Sunflower Seeds, Organic Flax Seeds, Organic Honey, Organic Wheat Gluten, Yeast. Contains 2% or Less of Each of the Following: Organic Molasses, Organic Soybean Oil, Salt, Organic Bulgur Wheat, Organic Corn Meal, Organic Soy Flour, Organic Wheat Bran, Organic Oatmeal, Organic Millet, Organic Brown Rice Meal, Organic Buckwheat Flour, Organic Cultured Wheat Flour, Organic Malt, Organic Soy Lecithin, Organic Amaranth, Organic Quinoa, Topped with Organic Oat. Contains wheat, soybeans. Produced in a facility that uses milk, egg and sesame seed products.